Celebrating Women in Aviation. 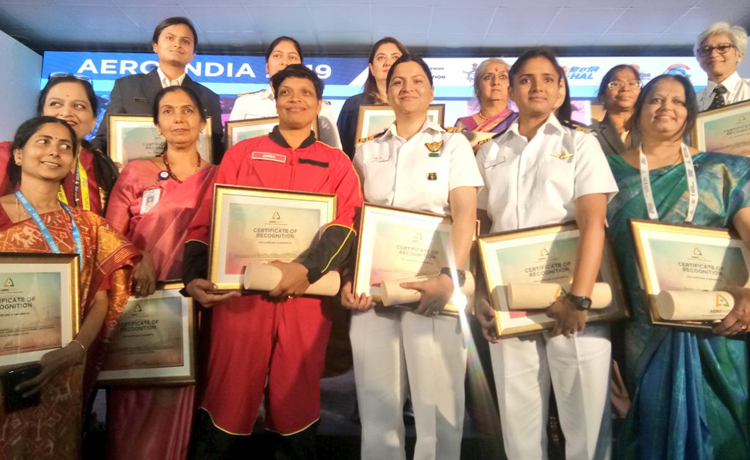 Women achievers from varied aviation backgrounds were felicitated on February 23, 2019 at Aero India 2019. It was last year in January that India's Raksha Mantri, Nirmala Sitharaman, adorned the olive green pilot's G-suit and soared high on a Sukhoi-30 MKI jet, to become the first full-time Indian woman Defence Minister to go supersonic in a sortie on the all-weather, long-range fighter. Continuing the traditions of recent firsts in aeronautics, Asia's largest military aviation exhibition, Aero India 2019, held from February 20-February 24 also witnessed a barrage of kickoffs especially with the women of the field. Ahead of the international women's day on March 8, the biennial plane carnival held at the Yelahanka Air Force Base in Bengaluru observed it's very own "Women's Day" on day four to showcase the achievements of women in aerospace and aviation sector. Apart from the felicitation of women achievers from the IAF, Navy, Army, Civil Aviation, DRDO, CSIR and ISRO during the women's Aero India day, a book as well as a film on 'Women in Aviation' was also released on the occasion. In 1991, the Indian Armed Forces were made admissible for the first time for women to serve as officers in branches other than medical. The Indian Air Force (IAF), started inducting women in its transport and helicopter fleets in 1994 and as fighter pilots in 2015, and last year in 2018, the flight engineer branch was extended to women officers. The investiture of women into IAF was also provisioned to multiply the base from which the officer cadre of the IAF is slotted. 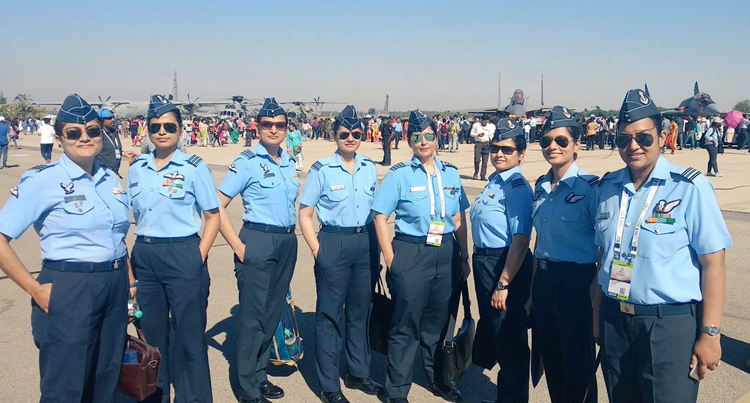 With time, the number of women officers is only increasing and the "Women's Day" during the Aero India 2019 has only added laurels to the above statement as they displayed their strong stance in the aviation sector. 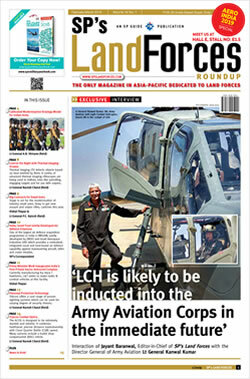 The first of its kind day witnessed several activities around these 'Queens of the Sky'. Apart from the felicitation of women achievers from the IAF, Navy, Army, Civil Aviation, DRDO, CSIR and ISRO during the women's Aero India day, a book as well as a film on 'Women in Aviation' was also released on the occasion. The lady officers from the aerospace sector also shared their journeys and experiences during a seminar. Indian Air Force officers making Aero India 2019 a grand success. The Hawk-I advanced jet trainer of BAE Systems and an upgraded version of the Russian made MiG-21 were piloted by all women crew on the day. One of the nation's first three women fighter pilots, Mohana Singh, flew a Hawk-I while Flight Lieutenants Amardeep Kaur and Sindhu Reddy, and Second Lieutenant Khushboo Gupta flew the Chetak during the air show. This was Mohana's debut at the air show and she will soon be joining IAF's frontline fighter squadrons. Mohana, who started her journey with PC 7 Pilatus, followed by the Surya Kirans and the Hawks for air-to-ground as well as air-to-air sorties, has the constant love for speed and wants to fly every aircraft there is. The Hawk-I advanced jet trainer and an upgraded version of the Russian made MiG-21 were piloted by all women crew on the day. Squadron leaders Kamaljeet Kaur and Shruti Chauhan took off the twin-turboprop utility aircraft Dornier-228. Not just that, it was four female officers who manned the Air Traffic Control (ATC) of the Yelahanka air base during Aero India's Women's Day. The Indian aerobatic team, Sarang that consists of four Advanced Light Helicopters (ALH Dhruv) also included one chopper aviated by a woman. The first woman pilot of the Sarang team, Second Lieutenant Sneha Kulkarni also performed certain astonishing sorties. This was the 33-year-old's second appearance in the show as she co-piloted a Dhruv. A B.Sc. graduate from Maharashtra, Sneha joined IAF in 2005, taking inspiration from her elder brother, Lieutenant Colonel Mangesh Kulkarni. Sneha's husband, Squadron Leader Raveesh Kumar is also a Sarang teammate. On Aero India's women's day, five para-jumpers also participated in the event and caught everybody's attention as they jumped off a Mi-17 chopper from a height of 4000 feet, gliding back to the air base in a parachute. The five women from the IAF skydiving team included Wing Commander Asha Jyothirmai, Wing Commander Sangita Paulraj, Squadron Leader Seema Sheoran, Squadron Leader Isha Gill and Flying Officer Tuhina Gaur, all of whom are from the flying, education and technical departments of the IAF. Jyothirmai from Hyderabad was a national athlete before she was commissioned into IAF in 1997. She started skydiving in 1999, has made 864 jumps since then, and holds a record for being the first woman officer to skydive from a microlight aircraft in 2001. While Paulraj is a post-graduate in psychology from Bengaluru who started her skydiving journey in 2009 and has 307 free-fall jumps to her credit. Sheoran from Haryana was commissioned in 2011 in the flying branch of the helicopter stream and is a second generation air warrior who has flown over 1500 hours on the Chetak/Cheetah helicopters. Isha, on the other hand, was commissioned as a technical officer in 2012 and Tuhina, who is also a second generation officer, is a former Accenture employee, who now flies the Chetak and Cheetah helicopters with over 350 flying hours to her credit. This was the first time a team of women paratroopers participated in the show. Five women from the IAF skydiving team also participated in the event and caught everybody's attention as they jumped off a Mi-17 chopper from a height of 4000 feet, gliding back to the air base in a parachute. The Air Devil team of Indian Air Force gets ready for Skydiving at ongoing Aero India 2019. Ace Indian shuttler and Olympic silver-medalist, P.V. 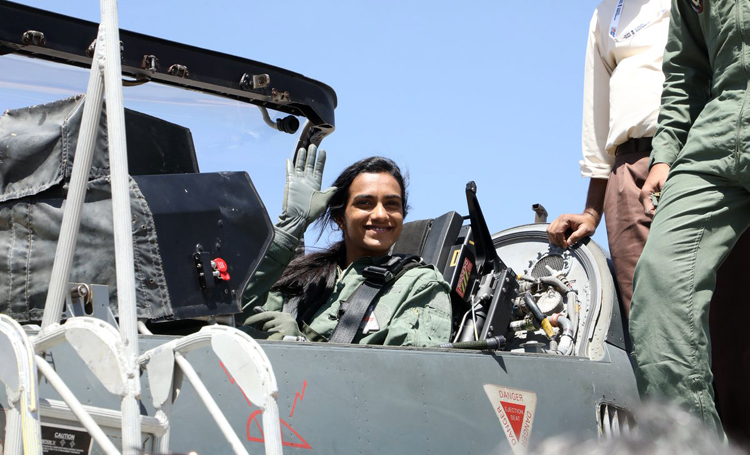 Sindhu took a flight in Hindustan Aeronautics Limited's (HAL's) Light Combat Aircraft (LCA), Tejas, becoming the first woman to have co-piloted the aircraft. Soaring with a sortie in the 'indigenous iron bird', the badminton sensation also became the youngest person to have taken flight on the aircraft. Sindhu had received an invitation from DRDO (Defence Research and Development Organisation). On the day four of the five-day Aero India show, while Sindhu was the highlight, IAF's Surya Kirans still stole the show performing the 7 plane formation. The seven aircraft team paid tribute to the deceased Wing Commander Sahil Gandhi whose plane crashed with that of a teammate during practice for the air show before it began. Indian Air Force now recruits women in almost all roles, from combat to support ones. In IAF, women are flourishing in several branches encompassing Air Traffic Control, technical, meteorology, administration, accounts, JAG (Judge Advocate General) and logistics. The women's day saw representation from all of these sectors like the President of Indian Women Pilot Association, Harpreet A De Singh; mountaineer and diver, Captain Namrata Patel of the Indian Armed Forces, aviation historian Anuradha Reddy and many others who had gathered to corroborate the women of the flying sector. It was only recently, Chandigarh's first lieutenant Hina Jaiswal, became the first Indian Woman Flight Engineer to be inducted by the IAF. As more and more branches that were earlier restricted only to men are opening for the female counterparts, women in aviation are proving that if given a chance they are only an added asset and can well manage multiple roles. Even when their deviation to aviation might not be the initial plan, they have made it turn out only for the better. Indian badminton star P.V. Sindhu became first woman to fly DRDO developed Light Combat Aircraft (LCA) Tejas at Aero India 2019. Today DRDO is celebrating Women Achievers in Aerospace. While taking over the defence space has been a significant milestone for women, they have been conquering civil aviation as well. Indian airlines hogs some of the highest percentages of female pilots globally. According to the International Society of Women Airline Pilots (ISWAP), globally 5.18% of pilots are women; while for India, the percentage stands at 12.4% with 1,092 of the total 8,797 pilots in scheduled domestic airlines being females. At a position where India is envisioning 2040 as the year when it will position itself among the leading aviation hubs, this recognition of women during the significant Aero India 2019, in all ways, highlights the steps being taken to ensure that the vision comes true. This celebration was not only a refreshment but also an encouragement and an assurance of wider wings to be spread and flown high with.